I mentioned the yummy sauce I served with my Jalapeno Hash Browns, but this morning I glanced through my random photos and realized I snapped a quick picture when I was making them. Yeah for me! This is a sauce you can serve with almost anything, really. I used it on the hash browns and my husband is still asking me about when I'm going to make it again with something. How can something so easy and quick be so good? Well, honestly, it's because I started by grabbing a ready-made product from my cupboard. I improvised a quick sauce by simply mixing sour cream with a cap full of Mrs. Dash Southwest Chipotle seasoning and added a quick splash of lime juice. That's it! Serve this with any Mexican dish from a casserole to tacos, burritos, Gordita's, etc. or with chili, Southwestern soups, tortilla chips, quesadilla's and obviously.... potatoes. Mix and chill for at least 30 minutes for the flavors to blend. Serve. 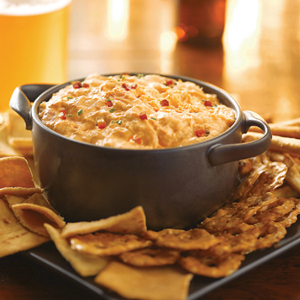 This morning I was thinking about what to post and I started to think about buffalo chicken dip. It's like eating buffalo chicken wings (we simply call them hot wings) but as a dip with chips or celery. Now I'm craving it - but it's also a great dip to feature this week as people start to plan snacks to serve at their New Year's Eve parties. I first started making this about 8 years ago but since I haven't made it recently I didn't have a picture. I decided to get one from the internet and a quick search made me laugh - because the sauce we always use for this is Frank's - and low and behold, they have a very similar recipe on their website. I never knew this and had never gone to their recipe site before. They use more chicken in their recipe but my readers know I always say play with your food - so if you want to use 2 cans - go for it! More dressing, more sauce, more cheese... have at it. Taste test and add and delete as you wish! Mix chicken, cream cheese and Frank's sauce in a bowl and microwave until heated through - stirring to break up the chicken chunks. Add the Ranch dressing and stir until blended. Mix in shredded cheese. Place in a lightly greased serving dish and microwave until heated through. Serve warm with chips or I like to eat it cooled with celery sticks. Growing up in the heartland of America, meals were usually a meat and potatoes something. Lots of steak, pork chops, ground beef... and lots of corn, green beans and potatoes. One of my favorites as a kid and still today, are friend potatoes and fried hash browns. These and fried eggs were actually two of the first foods I remember my Dad teaching me to cook as a small child - still so small that I had to pull a chair up to the stove to stand on to cook. I have always used fresh, raw potatoes, however, I recently started to make these using dehydrated shredded potatoes. Wow! So easy and yes... so good! Not having to peel and grate potatoes is a luxury. Since I decided to start stocking dehydrated hash browns, making these either as a breakfast item or as a side dish, has become super easy. The brand I use is Golden Grill - which is available at Sam's Club and Costco as well as on Amazon, but I haven't honestly looked for them in my local grocery store so I'm not sure if they carry them or not. I am sure almost any dehydrated brand would work - however, I can attest that this particular brand, once reconstituted with water is just like freshly grated potatoes and tastes delicious! optional: if you don't have jalapenos or don't want to use them, use a basic green/red bell pepper. Very good and not spicy. Drain the potatoes well, pressing to get out all moisture. Mix the ingredients together in a bowl, salt and pepper to taste. Heat oil in a pan to coat the bottom - on the stove top or use an electric griddle to many at once. Use about 1/3 cup scoops and press slightly with your spatula. Cook about 4 minutes on one side until dark golden brown. Flip and continue cooking until the second side is golden brown the centers are cooked through. Serve! I like them plain but also sometimes serve this particular style with a sour cream sauce I make by mixing in Mrs. Dash Southwestern Seasoning with sour cream. Love it! I don't think I've been to a Christmas gathering or a cookie exchange in the last 15-20 years that hasn't had this cookie there, usually in abundance. The Peanut Blossom is the popular, round peanut butter cookie that used to always have a chocolate star in the center, but now, most people tend to use an unwrapped Hershey's Kiss. This is a cookie my son and my husband love so I make sure to have plenty on hand. A few years ago I started to mix it up a bit. I was making these but realized I didn't have any more Hershey's Kisses in the pantry. Instead, I had bought a bag of Rolo candies. I decided to improvise. I rolled the dough as usual, dipped in sugar as usual, but then placed them into a mini muffin tin and pressed the Rolo candy in the center. A new tradition on our cookie platter was born. Now, I feel free to use any of a number of candies. Mini peanut butter cups, Rolos, stars, Kisses, Hugs.... use what you have! Cream the butter, peanut butter, brown sugar, and 1 cup white sugar together in a bowl. Beat in the eggs one at a time, then stir in milk and vanilla. Add the flour, baking soda, and salt; stir into the peanut butter mixture. Mix until well blended. Spoon dough into tablespoon sized balls, roll in the 1/2 cup white sugar. Place balls into lightly greased mini muffin tins. Press a Rolo candy into the center of each. Bake approximately 10 minutes at 375 degrees or until the edges are golden brown. Press a red or green candy on each if you wish, while the chocolate is melted. Allow to cool completely before trying to remove from the tins. You can also make these into traditional cookies by placing the dough on a greased or lined cookie sheet. Bake 7 minutes, press a candy into the center, continue to bake 3 minutes. Let cool before stacking on platters. Melt the butter, marshmallows and evaporated milk in a pan on the stove over low to medium heat. In a very large bowl mix the rest of the ingredients. Add the melted marshmallow mixture. Stir and mix well. Press into a greased or foil lined 9X13" pan. Press flat and freeze or refrigerate overnight. Slice into 3 sections and slice each loaf into sections. After you bake and cool your cookies, use a royal icing and small round icing tip to pipe around the outside of you puddled cookie. Use the glaze icing to fill in the puddle. Let harden completely and usually takes overnight. During this time you can make your homemade fondant (or use store bought - White Rolled Fondant ) and use it to form little round balls that will be the snowman heads. Let them dry completely. I put them on powdered sugar sprinkled foil. They can take up to a day or two to dry depending on the humidity in your house. Although I've been making these easy no bake bars for years, I've never thought about making them for the Christmas cookie platter until this year. This bar is similar in flavor to a no bake cookie, but with just a few extra ingredients that make it so yummy! I frosted and sprinkled red, white and green nonpareils on it, but you can certainly decorate as you wish! (I forgot to list the oatmeal in the original post - that is what I get for multi-tasking. I've added 1/2 cup oatmeal I put them in them. I have the 'whole grain' style oatmeal but quick oats and rolled oats are fine!). Thanks Becky for the heads up that I forgot them!!! Mix and press into an ungreased 9X13" pan. Chill. Mix icing, spread over bars and return to the refrigerator to chill. You can sprinkle with edible decor before chilling if you wish. Cut into squares. This is the brand I use; Solo. I can find it at my local Walmart (usually) although some years it's been so hard to track down I've gone to 3-4 different grocery stores and never found it. It's hit or miss! 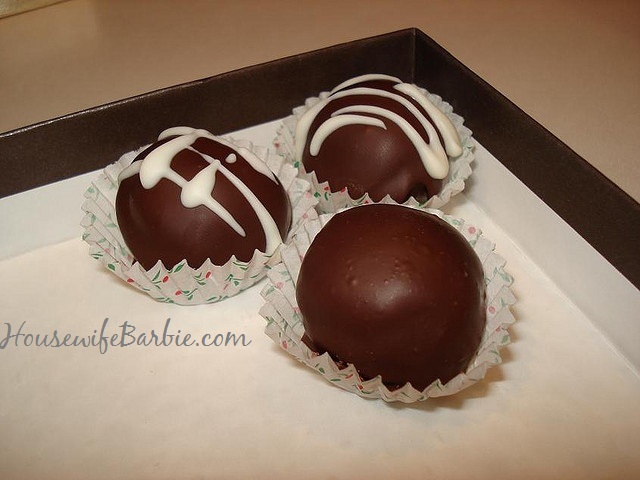 As I continue to bake for the Christmas holiday cookie trays, the cake balls are complete! These are a favorite of my husband, who has already 'tested' three of them! Ha. So pretty, you can make these and decorate as you wish. I list my recipe with white candy coating but you could do them in chocolate if you wish as well. Grease and flour a 9 X 13″ cake pan. Preheat oven to 350. Cream butter, sugar and eggs. Make a paste with the food coloring and cocoa and add to mixture. Add salt and flour alternately with buttermilk and vanilla. Mix soda and vinegar and add to the mix. Beat just until smooth. Pour batter into prepared pan. Bake approximately 30-35 minutes or until done. Remove from oven. Cool completely. (Since you are not making this into a layer cake, you can let it cool in the pan if you wish. You can use your favorite frosting (that link goes to the frosting I use for Red Velvet) or here is a basic cream cheese frosting recipe to use, as many like cream cheese frosting with this particular cake. You could even use store bought if you like. Mix your frosting recipe into the cake crumbs. Start with about 1-2 cups of frosting and mix well with a wooden spoon and then, your hands. If it’s a dry mix, add more frosting by quarter cup increments. You just want the cake to be the consistency of play dough so it holds together well and forms balls. Even though I don't crave nor love chocolate, I do enjoy a good brownie every now and then. Not too tall or dry, not to cake like. Not too underdone. It has to be jussssst right. And this is one. Your grandma, and heck, probably even your great or great great grandma made this one. It's a classic but there is a reason for that. It's just the right consistency, the right flavor, the right everything. Give it a Christmas spin if you wish by topping it with a frosting and sprinkle of red and green... or just leave plain and dust with white powdered sugar over a paper doily. Personally, I don't mind if they are just plain, because they are just plain good. In a bowl, mix oil and sugar with a wooden spoon. Add eggs and vanilla; stir just until blended. Add the flour, baking powder, cocoa and salt. Beat with a wooden spoon until well blended. Pour into greased or parchment lined 9 x 9 pan. Bake about 20 minutes. The sides will pull away from the pan and the middle will be set. Cool completely without cutting. Frost if you wish - or sprinkle with powdered sugar - and cut into squares of your own choice of size. I've posted about cream horns (also can be called by some 'lady locks' or 'clothespin cookies') in the past but you cannot have a Cookie-A-Day until Christmas theme without them! Thaw the puff pastry according to directions. I used just 1 of the two sheets and it makes about 15-16 cream horns so the whole package would make about 32. Preheat your oven to about 400 degrees. Lay the puff pastry out on parchment paper (or lightly flour your counter). Slice the pastry about every half-inch to make about 15 strips or if you want to make them larger, about 8 1-inch slices. Wrap one long strip of pastry around your mold. Leave the large round end open without it overlapping to make removal easier later. I spray the tops with butter flavored Pam and then sprinkle with large crystals of sugar or Xylitol (available through my low carb product link at the top of the page). Bake on a lightly greased or non-stick baking sheet for about 10-12 minutes until golden brown and crisp. While they are baking, mix up your favorite butter cream or other filling. Removal from oven, remove from pan to a cooling rack and let cool completely. Use a pastry bag with a large tip to squeeze filling into each horn. These are wonderful if you can let them set up or even refrigerate them to chill the filling but they are delicious eaten immediately too! Cream the Crisco and butter. Add the sugar gradually and then the creme and vanilla. Beat well until it's smooth like whipped cream. Fill cooled or chilled cream horn forms. Does not need to be refrigerated for storage. With 'truffles' on the brain from the previous post I went in search of my old files from 2007 and 2008 to find the almond truffles my daughter made. She had just turned 17 when she made these for a new boyfriend. So quick and so easy she needed little help from Mom and managed to pull off some beautiful dessert truffles, which we packaged using (recycling) a "chocolate candies" box from Harry & David. These are just so pretty and so incredibly creamy and smooth that they will probably be some of the first to go on your holiday goody table or tray. Combine evaporated milk and sugar in small saucepan. Cook over medium heat until mixture comes to a full boil. Boil 3 minutes, stirring constantly. Remove from heat. Stir in chips and almond extract, stirring gently until smooth. Chill mixture about 45 minutes until it can easily be shaped into balls. Roll into the crushed nuts or dip in melted chocolate. Drizzle or sprinkle with nuts if desired. Chill until ready to serve.